I once fell in love with one of Portland, Oregon’s 583,776 residents. During the autumn of 2008, I packed my belongings into USPS boxes and made the move from rural Georgia to the city. While the relationship ended weeks later, I remained in Oregon for several months. On my own, I explored the nation’s 29th largest city. The iron whoosh of the max light rail trains, resembling white bullets, can be heard at any given hour, ratting the aging downtown edifices and homes that have the misfortune of being built too close to the tracks. Buses do not cease their routes until 2am in the morning, only to begin again four short hours later. Despite its size when compared to tourist meccas such as New York, Los Angeles, and Chicago, U.S. News ranked Portland’s public transportation system the 5th best in the nation. As if created by Sir Isaac Newton himself, P-Town and its citizens are in an endless state of motion, sometimes working, mostly playing, and forever shopping. Conveniently situated between two Light Rail platforms, Pioneer Place Mall is the mall to visit when doing some intense retail or window shopping in the city. In early October, I paused in front of Pioneer Place’s Apple Store to skim the news headlines that were scrolling across the dozens of slender aluminum monitors lining the shop’s window display. According to CNN, the economy was tanking, breeding uncertainty among consumers. In the corridors of the glossy, four-tiered Pioneer Place Mall, this was not so apparent. Customers darted around me where I stood, toting shopping bags from stores of varying expense, from H&M to Betsey Johnson. The nation’s financial sector was indeed hurting. Yet despite its perpetually overcast skies, commerce in Portland was happily marching on. Still aching from the end of my own relationship, I felt compelled to do the same. While P-Town has retail options for all budgets, it particularly excels at the secondhand. I was surprised to find a Goodwill shop in downtown Portland that was arranged more like a boutique than the average thrift store. The same proved true for other secondhand stores, including Red Light Clothing Exchange. Recently named one of “America’s Best Clothing Stores” by GQ, Red Light offers customers the chance to swap old clothing for something new from their racks, which frequently contain designer items. Regardless of if one’s style is classy or kitschy, Red Light has something for everyone. Powell’s Used Books also follows a similar bartering model, making knowledge an inexpensive commodity. Sprawling across 1.6 acres, the bookstore boasts color-coded rooms for every genre of written word imaginable. Powell’s is believed to be the largest independent bookstore in the world. “We’re waiting from some guy from The Guinness Book of World Records to get back to us. We’ll be ordering a double shipment of that edition,” a clerk jokingly told me. The notion that you can have a low cost of living, freedom of creativity, and be successful at the same time is an ethos that is unique to Portland. This mantra is partially responsible for the large amount of homeless individuals living in the city: 14,000. The homeless are closely followed by artists in number, who amount to 10,000, according to the 2000 Census. These two demographics coexist on the city’s streets and Light Rails. It’s arguable the city has a “homeless problem,” it has an “artist problem” as well. While living in a low-cost apartment in Beaverton, a Portland suburb, I was also able to find priceless entertainment in venues like Powell’s. I frequented Jackpot Records, a secondhand music store where I found gems in 45’’ and CD form. Even the live alternative was a feasible option. Concerts that were ordinarily off-limits for those under 21 in Georgia were accessible to me as an 18 year-old living in Portland. At Berbati’s Pan, I was able to enjoy the Shiny Toy Guns with an audience that ranged from their teens to my grandparents’ age. Perhaps best of all, I was able to purchase my own personal, eco-friendly form of transportation: An electric blue 70s-era Schwinn bicycle. I was hardly the only cyclist on the street. 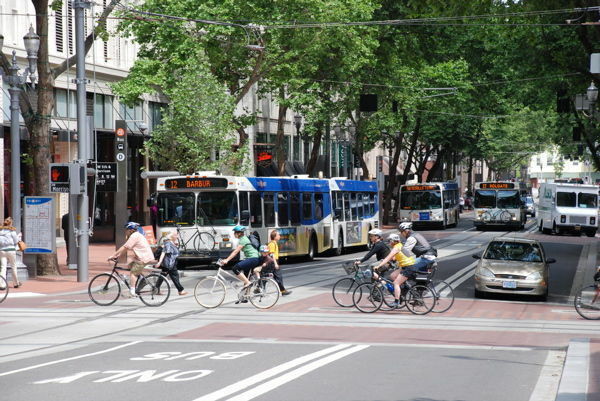 An average 47,000 Portlanders use bikes for their daily commutes. Because the demand for alternative transportation is so high, bicycle shops are commonplace, canvassing P-Town street corners like Starbucks. While living in Portland, I was able to exist in a healthy, expressive way that was previously unknown to me back in Georgia. While I’d flown in through PDX airport, I opted for the more scenic route on the journey home. I once fell in love with one of Portland, Oregon’s 583,776 residents. Yet as my Greyhound made its way out of Portland’s pulsing, red brick heart, I realized that I’d fallen for the city instead.